Welcome to the World of Suzanne Burke. Three VERY Different Books: ONE very Different author. – Welcome to the World of Suzanne Burke. Welcome to the World of Suzanne Burke. Three VERY Different Books: ONE very Different author. Evocative … Provocative … and Proud. Well, Hi there! I’m so pleased you stopped by. Kick your shoes off, sit a moment, let’s get to know one another. So, my name is Suzanne Burke. My friends call me Soooz, I hope you will soon join them. I live in the beautiful city of Sydney Australia. I quite literally grew up on the streets of my city, I know her intimately, I love her dearly. I’m an author. I love the sound of that. I love the fact that I can respond with those words whenever I’m asked what I do for a living. Yup! I’m an author. It took five decades to begin to write “Empty Chairs” Book 1 of the Standing Tall and Fighting Back series. It is my memoir, the beginning of my journey. The subject of ‘Child Abuse’ is confronting, there is no getting around that. But I am here. I did more than survive my life. I lived it! and I continue to live it, in happy anticipation of the next sunrise. MY MEMOIRS ARE WRITTEN UNDER MY PEN-NAME OF STACEY DANSON. Stacey Danson, lived through and beyond horrific child abuse. This book tells of her brutal beginnings, the streets of Sydney at the age of eleven were preferable to the hell she endured at home. She ran, and those streets became her home for five years. She was alone, ill, and afraid. Stacey also had an unshakeable belief that she would do more than just survive her life. She would not allow her future to be determined by the horrors of her childhood. She reached out for something different; there had to be more to life; if she could only find it. She had a dream of a life where pain and humiliation had no place. She was determined to find that life. Empty Chairs is the beginning of the journey. Now she is living the dream. Here is just one, of over 380 4.5 and 5 🌟🌟🌟🌟🌟 Reviews. For EMPTY CHAIRS. 5.0 out of 5 stars A hard read, but worth every tear. When I began reading Empty Chairs by Stacey Danson I was completely unprepared for what I would find. If it were a novel, I would have put it down. The matter-of-fact narration depicting extreme sexual exploitation of a small child by her mother turned my stomach. But Empty Chairs isn’t a novel. It is Stacy Danson’s life story. I read on through tears; my heart filled with horror, sympathy, and anger. But I read on. In her superbly written auto-biography, the author unfolds a vision of hell that few can imagine, but is the life of far too many innocent children in our society. Stacy was beaten brutally and repeatedly. She was forced to service a stream of men who paid her mother – not occasionally, but every day. When her mother wasn’t pleased with her performance Stacy was locked away in a dark closet where claustrophobia threatened her sanity. Stacy was only three. Her earliest memories are of abuse. Stacy was only five when her mother sold her virginity to the highest bidder and she was brutally raped. The daily torment continued until Stacy, in an amazing act of defiance, at last said no and ran away. She had only been allowed to attend three years of school, between six and nine years old, and at eleven was alone on the harsh streets of Kings Cross in Sydney, Australia. But Stacy survived. In her short time attending school she learned to read. Her love of reading, and her hunger for knowledge, has continued for over forty years, as is apparent in her masterful writing. Horrific details of her life are delivered in almost emotionless, matter-of-fact clarity, and her dark humor is equally dead-pan. Yes, I laughed at times, in a very somber way. But without that detachment and humor the story would be too tragic to read. She emailed the book link . and told me it was her auto-biography and might be hard to read. I never imagined. It was the hardest thing I have ever read. I can not possibly understand how hard it was to write. Though I think this book should be read by every adult on the planet, I must warn you it is a glimpse into hell. Stacy carries the emotional and physical scars, some severe, to this day, but I am amazed she even survived. It is far more unfathomable that she grew into such a strong and beautiful human being, and equally wonderful writer. I am quite honored now to be on her friends list. But as she says, she didn’t just survive, she choose to live, and she choose to speak out and shine a light into the dark corners of our world that most of us chose to ignore. PURCHASE PRICE $2.99 USD On KINDLE. FAINT ECHOES OF LAUGHTER Book 2 of the STANDING TALL & FIGHTING BACK series. The shocking and spirited sequel to the much-praised ‘Empty Chairs’. Life on the streets of Sydney was preferable to the nightmare Stacey Danson had survived in the hell that was home. She hit the streets running at the age of eleven, and armed with a flick-knife and a fierce determination to live a different life, she began the journey from the 1960s to today. For those that came to know ‘Sassy girl’ in ‘Empty Chairs’, and for those caring people that asked how her life worked out from there, ‘Faint Echoes of Laughter’ continues the story. For those that haven’t met her yet, this book stands alone as a tribute to the kindness of strangers, the loyalty of true friendships and the way things really are on the streets of any town …. anytime. One of over 183 5 🌟🌟🌟🌟🌟 Reviews. I, like everyone else who has reviewed it, found this book very moving, and so completely honest. Stacey Danson has a rare gift of description; she brings places to life in very few words. But her ability to share emotions is even more striking, and in fact it left me breathless. It’s a while since I read Empty Chairs – I’d forgotten how good this writer is at this sort of thing. Ms. Danson plunges straight into the story and suddenly we are right there in the damaged container in the docks with her, meeting Momma and Cassie and Jamie and Baby Jenny and herself, ‘Sassy.’ All these characters emerge so deftly and subtly that it seems we have known them for a long time and understand them fully. This was one book which I couldn’t stop reading – I had to read on, to hear how they coped with Momma’s baby, to find out what happened next to these brave children whose independence was so impressive, and who lived together as so much more of a family than most real families, looking after and caring for each other. Ms. Danson’s courage in writing this has produced a book which is in a class of its own. Her courage and her writing ability both deserve the highest praise. Purchase series “Standing Tall & Fighting Back” here. Book 3 in the ‘Standing Tall & Fighting Back) series is “Still Sassy at Sixty!” It will be out in March 2017. My Fictional works are written under S. BURKE. Book 1 of the'(Unintended Consequences) series. “ACTS OF BETRAYAL” A no holds bared psychological thriller. Uncompromisingly brutal & Terrifyingly possible. Acts Beyond Redemption takes you on a twisted, deadly, journey. Mike Matheson is head of a Special Task Force set up by the F.B.I to track down and apprehend the serial killers responsible for 18 brutal murders. The team are exhausted, frustrated, and ready to burn out after almost five years and no leads. Their nightmares are stripping them to the bone. Nothing has prepared them for this. Someone on the inside is deflecting their weary eyes away from an incomprehensible and shattering truth. Who will be buried in the shattered remains of a country where freedom and honor are treasured above all things? Just how far will those elected to protect and defend go, to keep the American dream alive? 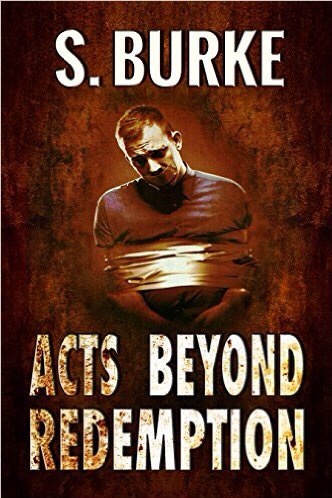 ACTS BEYOND REDEMPTION is a thrill ride that stays with you long after you’ve finished. A complex, fast-paced novel that grabs your attention from the very start, S Burke masterfully delivers an intricate story of greed, ambition, and murder that will shock you. We meet the members of a Special Task Force set up by the F.B.I to track down and apprehend the serial killers responsible for 18 brutal murders. After five years of dead ends, the team undercover new information that poses more questions than answers. What ensues is a quest for justice, where allegiances are suspect, and nothing is what it seems. Are the killings the brutal work of a sadistic serial killer? A conspiracy of a soiled government? F.B.I? C.I.A? This is one of the best suspenseful thrillers I have read in a very long time. The character development is superb, and the pace is fast and intense! With twists and revelations, and numerous points of view, this is a book that demands your attention. A spectacular thrill ride, and I highly recommend it! And a review posted just this morning! I don’t often give books a five star review because every once in a while a book will come along and truly knock my socks off. This is one such book. From the very start the reader is on a quest to find out what is going on with the author never quite revealing what you expect. You’ve heard stories described as a roller coast ride – well this one loops the loop, twists and turns in unexpected places, running at a pace that leaves you breathless, with a nightmarish trip through a ghost tunnel thrown in for good measure. By the end of the story you are not sure anyone is who they claim to be or who will be left alive. Fantastic story. Looking forward to the next one! On SALE at only $0.99 USD on KINDLE. BOOK 2 in the series (Unintended Consequences) is ACTS OF BETRAYAL. AVAILABLE FOR PRE-ORDER IN JANUARY 2017. I leave you with a quote from a marvelous man who knows exactly what challenges he faced. Thank you so much for making the time to stop in and get to know me a little better. I am a proud supporter of #Indie Authors on #RRBC. Have yourself an “Aussie” little Christmas. Aka Great food, Great company and a place filled with love! Soooz, you did a fabulous job on this and I hope this is successful for you today. Thanks so much for stopping in, Jo! It’s an exciting time. Wow, what a comprehensive site, Suzanne. You are so passionate and prolific and it shows! Best wishes in all your brave and creative work. Lisa, hi! Thanks for making the time to stop by. I appreciate it a great deal. Great post, Soooz… I have two of these on my Kindle and I look forward to diving into them!